How did the topic of marriage come up? "We had been dating for about nine months — but we had already moved in together at four months and we had agreed early on that we were both all in. It was my birthday and I was in a bit of a bad mood. I was lying on the couch hate-watching Bones after work when he bounded in. He thinks that he gave me a beautiful speech about why we should get married, but really he just stammered a few half sentences and pulled out a beautiful infinity band from Mociun." "Our wedding was at Mount Gulian in Beacon, New York, on what must have been one of the hottest days of 2012. We had about 80 people, half family and half friends, and a very simple setup. 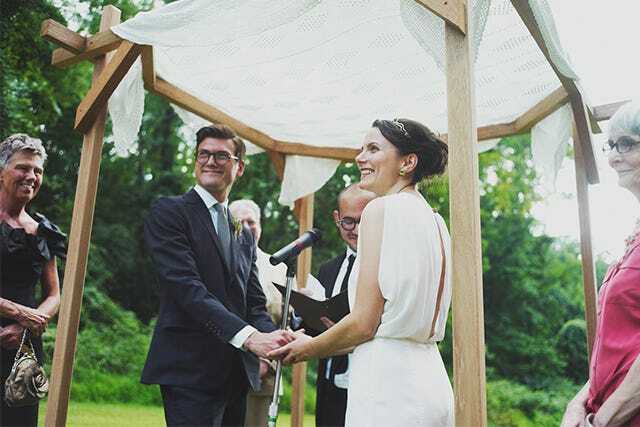 My husband's brother built a huppah for us, which was definitely one of the best presents we received." "We wrote our own vows — although we procrastinated until a few days before, so I ended up writing most of them with my husband's stamp of approval." What did you do the morning of your wedding? 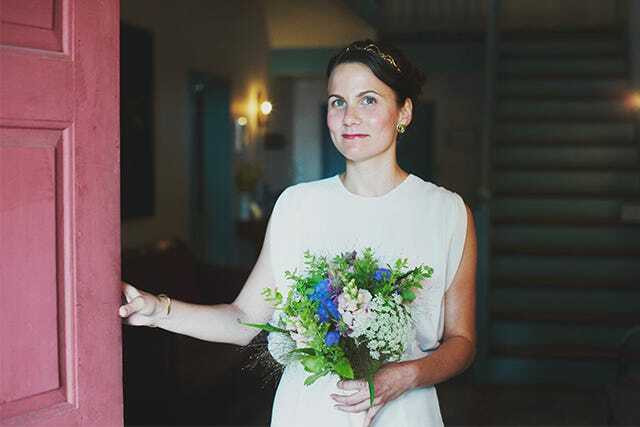 "I really overestimated how much time I'd have the morning of the wedding, so I had planned to go for a run, eat breakfast, arrange the flowers with my friends, and then get my hair and makeup done. But, thank goodness my amazing friends took the reins on the flowers because I barely managed to get my hair done (by the fantastic Meg at The Parlour Brooklyn) and do my own makeup. And, I was still late to the venue." Who walked you down the aisle? Was there music playing? "Both of my parents walked me down the the aisle, which turned out to include a pretty big hill so I'm glad I had someone on each side to help me in my crazy heels. 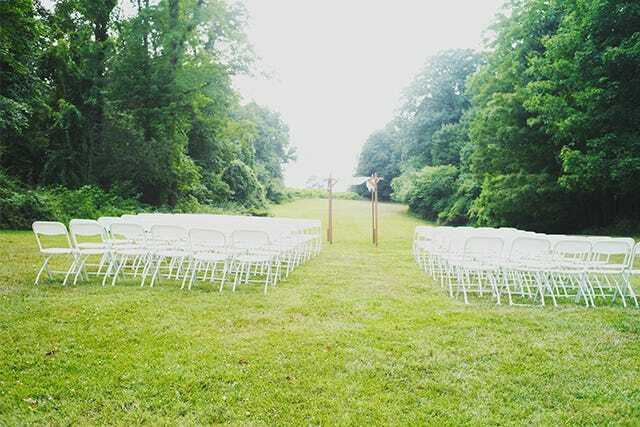 I walked out to "I'm Loving the Street" by Bonnie "Prince" Billy, and after the ceremony, my husband and I walked back to "Love Is All You Need" covered by Echo and the Bunnymen. I have to credit him with most of the excellent music choices on that day." What was the menu at the party? "We loved our caterer, Main Course Catering. We had great local veggies and sides served family style, and short ribs and halibut. Everything was delicious." "We went to Stockholm and the island of Gotland for our honeymoon. It was a beautiful, relaxing experience, despite the fact that our first cabbie told us we should've gone to Finland." "I thought I wouldn't be someone who got stressed out planning my wedding. But, it's a crazy process that involves everybody's family and everybody's opinions, and I succumbed to some wedding insanity. But, all of the work was worth it, because it turned out just as we intended and we both had such a wonderful time — which is the most important thing."